Portocolom Lighthouse is located on the northeast tip of the bay of Portocolom. It was lit for the first time in 1863. One of the most distinctive and photographed lighthouses on Mallorca Island. With blue and white wide stripes has also been the focus of numerous pictures and paintings. Situated at Sa Punta cliff is visible from almost any point of Portocolom. Say hello to people directly on arrival from the sea, and can be seen at a distance from the road between Portocolom with Felanitx. It is one of the most estimated symbols by the inhabitants of Portocolom and a walk totally recommended, is the walking tour from anywhere in the village to the lighthouse. 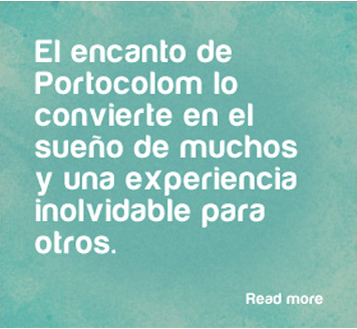 Both day and night will never go unnoticed by visitors Portocolom.